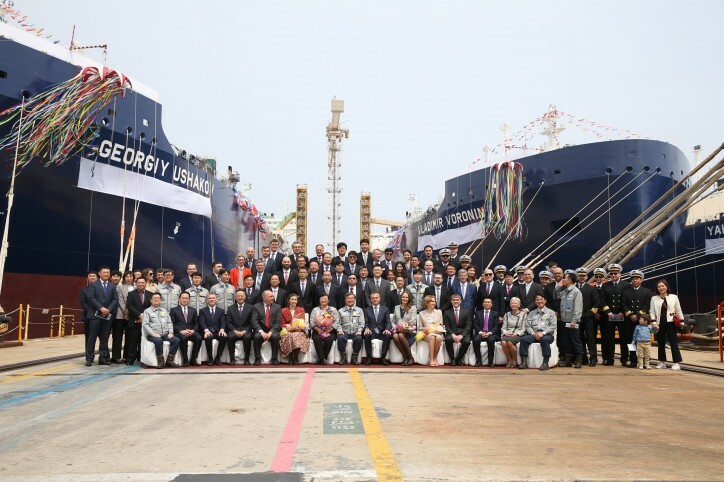 On March 28, 2019, a naming ceremony of co-invested 4 new built LNG carriers by Teekay and CLNG was grandly held in DSME shipyard in South Korea. The 4 new buildings are specialized for Yamal project. 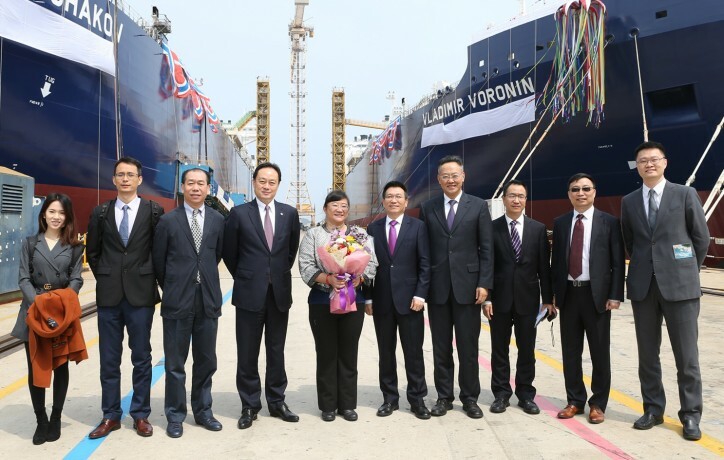 Vice chairman of the board of Novatek, Lev Feodosyev, board director of Yamal Trade Company, Gabriel Brecque, CEO of Teekay Group, Kenneth Hvid and President of COSCO SHIPPING Energy, Liu Hanbo, CEO of China Merchant Energy, Xie Chunlin, General manager of CLNG, Chen Ping and guests from DSME shipyard, China Development Bank, Class Society etc totally over 100 participated the naming ceremony. 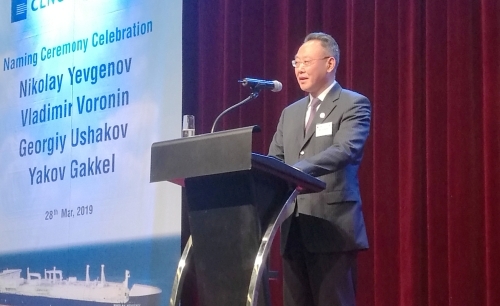 Mr Liu Hanbo, President of COSCO SHIPPING Energy addressed at the ceremony. He indicated that COSCO SHIPPING Energy, with the largest tanker fleet of the world dedicated to providing high quality energy transportation solutions for global customers, promoting the realization of world-leading goals. 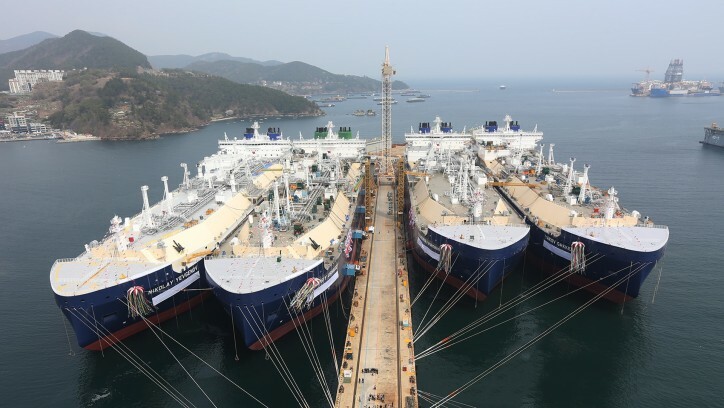 After the delivery of these 4 brand new ships, COSCO SHIPPING Energy’s LNG fleet will be enlarged. COSCO SHIPPING Energy will fulfill its ship owner responsibility, together with Teekay group to provide safe and reliable LNG transportation service. The four LNG carriers, named after the former USSR Arctic explorers, are four of the 15 Arctic-Class vessels built for Yamal Project. With LOA of 299 meters, Beam of 50 meters and capacity of 174,000 cubic meters, the vessel will be delivered to Yamal Project and put into operation by the end of 2019. It is reported that the YAMAL LNG project is an integrated project involving exploration and development of natural gas liquefaction and LNG transportation jointly developed by the oil and gas giants of China, Russia and France. It is the largest liquefied natural gas project in the world and also the first super polar project to be implemented after China putting forward “the Silk Road Economic Belt and the 21st-Century Maritime Silk Road“ initiative. The project boasts 3 liquefied natural gas production lines designed for annual output of 5.5 million tons. It can produce 16.5 million tons of liquefied natural gas (25 billion cubic meters) annually after construction, 50% of which will be exported to Europe and 50% to Asia, amongst 4 million tons will be shipped to China.